Feet: Fit For (Running) Purpose? Sport Relief Day is nearly here which means the final mile of your HUGE 268 mile challenge. CONGRATULATIONS – and THANK YOU FOR ACCEPTING MY CHALLENGE! I can’t be with you on Friday but I will be thinking about a very special group of 13 schools and 1600 pupils that will always be the first to take part in Cracking The Spine 2014 – and that includes you. 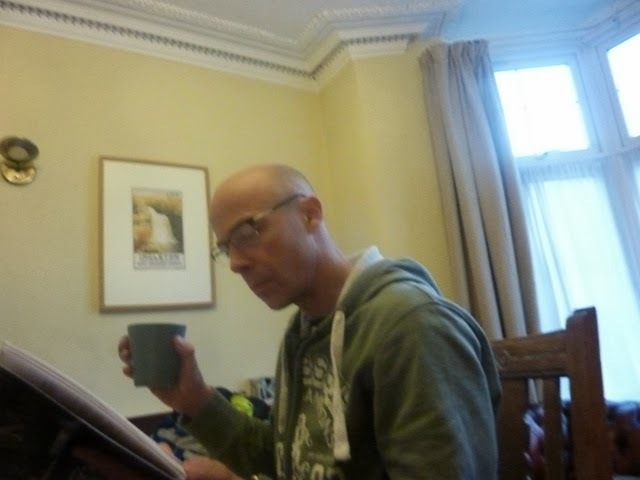 Get a cup of tea and settle down for a good read! So on Saturday I re-sit my exam. because I want to get a different result. sleep as well as I can. and some of you – like me - are about to start. challenge and raising money for Sport Relief: That’s incredible and YOU are part of it. boost and something extra to smile about. race in some of your lessons. I’ll be back to see you before Sport Relief Day. As for next week? I commit to doing my best. If someone had told me four weeks ago that we’d raise £4k in pledges for what was no more than an idea on a Facebook page I’d have, at the very least, raised my eyebrows in vintage Roger Moore style. If someone had told me four weeks ago that people we’d never heard of would pledge hundreds of pounds to come and stay with Family Mouncey on the strength of an idea of a FB page, you’d be hard-pressed to stop me laughing. A lot. And finally if someone had told me four weeks ago that we’d get over 1000 folks viewing a single FB live Q & A session with some bloke who hadn’t even reached half way during his previous outing on the target race, you’d have had to wait a very long time to get any sense out of me at all. Yet all of those things have happened. While thirteen years on this whole self-employment lark is still very much a work-in-progress for me, one thing I do know: Activity breeds activity. It may not initially take you in the direction you think you need to go, but stuff always happens as a consequence; some of it will not be on your first choice timescale – but of it will be good. The discipline is to get out there and do. The Spine Race schools challenge has been at least two years in the making. I’ve spend a lot of the last five years or so trying to make a triathlon-based learning program of my design fly in schools and with young people who are NEET (Not in Employment, Education or Training). That’s not happened (yet) but what has happened is real interest and opportunity from a prison service battling to make any dent in a re-offending rate in this country that touches 60%. The school stuff alongside The Spine Race came out of being severely pissed off for wayyyyyyy too long. Work-wise I was struggling and getting worryingly good at doing periodic depression. While Charlotte was getting fulfillment from her role as a mum, Daddy wasn’t getting the same deal from his work or his sport. The boys were great distraction but I was getting leakage at a rate even Thames Water would be having kittens over. Finally I did a blank-sheet exercise – if I could marry personal drivers and professional strengths what might that look like? – and came across a pioneering program in Australia http://imp.org.au Then I DNF’ed at The Spine Race in January, re-discovered some mojo - and immediately starting plotting a return in 2014 this time with added leverage. So I’m immeasurably proud that we now have five schools launched and chipping away at their 268 miles and there’s more cueing up. The last couple of months have also been my most consistently fulfilling for a very long time. I’ve met some great people and done some new scary fun stuff. Last Monday was a case in point: 150 pupils at Riverside Junior School in Hebden Bridge confined to a sports hall ‘cos it’s bucketing down outside. Together with a good collection of spectating parents and the chair of school governors - they’re all mine all morning! There’s no film this time but the school took some pictures which I hope to be able to share with you – ‘cos we had a blast. Talking to the school a few days later and I get the news that the kids are running in break times and the teachers are blown away by the goal-setting stuff the pupils are coming up with and the conversations they’re still having from the morning. ‘But I’m still not generating much at all, ‘I said to Charlotte. On the training front two ankle injuries on the same ankle have meant running has been the stuff of fantasy. You might as well have driven a bus through my training plan. Hiking and biking has been my world, which has messed with my head periodically until I remember that blazing running speed is not really going to be a factor in this race – the ability to endure, cover the ground consistently and look after self in probably crappy conditions is considerably more important. I’m stronger than I was and I’m healthy, and if I can just manage this creaking ankle back to something near full function the final 12 weeks push will get me to where I think I need to be. Will it be enough? Right now I don’t really care: It’s just good to enjoying the journey again. It's always a pleasure going to Edale, despite it being only a few minutes drive from where we live, it feels like you are stepping back in time. It is particularly important to us here at Cracking The Spine as it is of course the beginning of the Pennine Way, which gives rise to all sorts of symbolic stuff for Andy and the rest of the competitors. 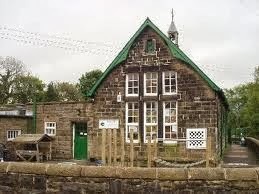 Edale primary school is small but has a huge personality! There were 13 children and their techers waiting expectantly for us this morning. We were also joined by Darren Hunt, who has been a great help supporting Cracking The Spine on Facebook. He had the pleasure of being Andy's glamourous assistant…. 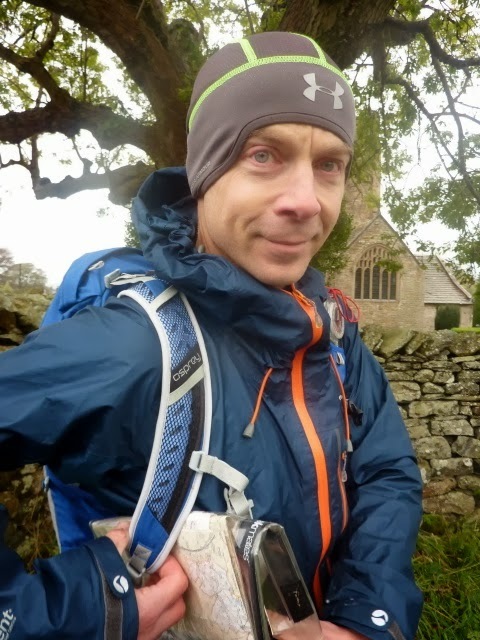 We have certainly come across many mini athletes on our school rounds, and Edale, no surprises, has it's fair share, they were certainly already pretty clued up about running as a sport and they were certainly giving Andy a fair grilling when it came to question time. They looked on in astonishment as he told them about his epic triathlon from England to France, although as he was describing his English channel swim, I did hear a small voice pipe up exclaiming, ' That doesn't look very hard!'. Hmmmm...challenging talk! 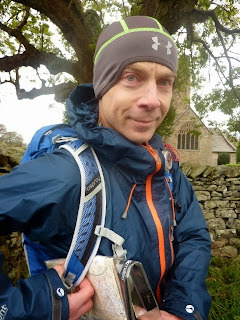 It was great to have a Darren along, he is going to be doing the Spine Challenger this year, which is no mean feat in itself , being 106 miles in length, from Edale to Hawes. It's always good to put a face to a name, especially as Darren has been a huge help on Facebook spreading the news on our project and encouraging funding. He led the children off on the first mile, starting from the beginning of the Pennine Way. I'm pretty sure I saw Darren and Andy looking more than a little uncomfortable at the thought of what lies ahead come January, mwahahahaha. I'm also sure that you lot doing the race will certainly have quite a few young supporters at the start in January! The children loved the idea of being able to follow the progress of the race and come and meet the runners in January. I know I mention it every time we come back from a school, but it is amazing to see so much enthusiasm in the children and the teachers - everyone is full of beans, the teachers are just as excited as the children. It's fantastic to see children being given every possible opportunity to try new things and encourage to discover new hobbies and sports. 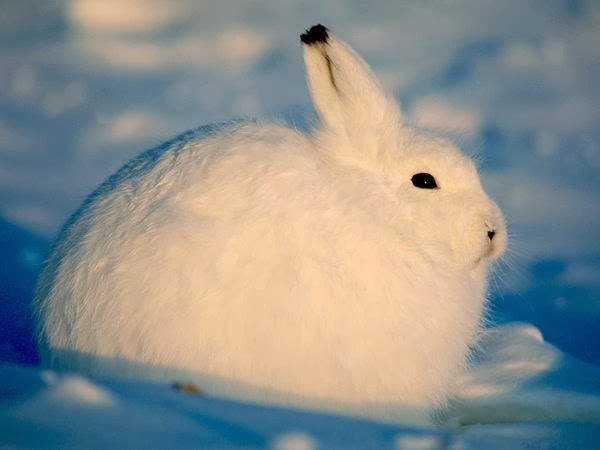 courtesy of national geographic - arctic hare. cute. Being at the beginning of The Pennine Way and at the heart of a National Park, Edale school has a very special relationship with the National Park Rangers, and we had the pleasure of meeting up with an Area Ranger - Sheila, who kindly gave up a few hours of her busy morning to talk to us about the work she does out on The Pennine Way and how it is so important to educate the children about he very special place they live in. After all they are our future and all that! Everyone we have spoken to and who has heard about Cracking The Spine, has given us amazingly positive feedback, and have bent over backwards to help Andy and us to get things going. It's impressive to hear the daily work that goes into maintaining areas such as the National Parks, so that we can enjoy them and run all over them. You better keep your eyes peeled in January as there is all sorts of unusual wildlife out on The Pennine Way, for instance, fact for the day - did you know that we have Arctic Hares living on Bleaklow?! Sheila also stressed the importance of not underestimating the wildness of our national parks - it being all too easy to do just that, even the more experienced among us I'm sure have taken our more diminutive peaks for granted! More on that in the film - don't want to give it all away! As we approached Horton in Ribblesdale the clouds began to recede and I didn't feel quite so silly with my sunglasses perched optinistically on my head. 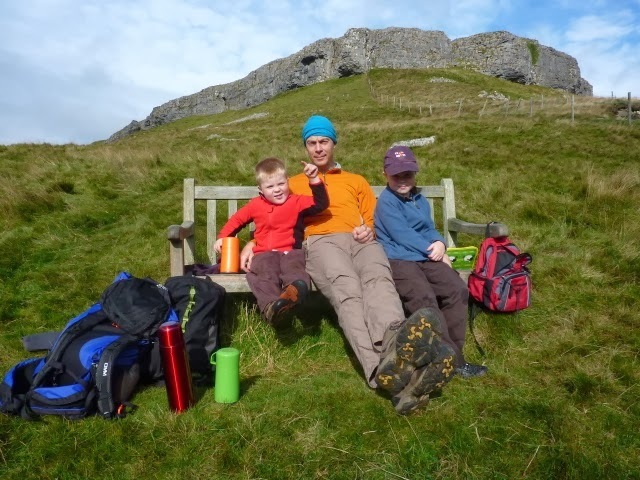 It was time to meet school number 2 , Horton in Ribbkesdale primary school, nestled at the foot of mighty Pen-y-Ghent. It must be hard to be anything but a runner when you study in a village like this. Surely the children must be born with the legs of mountain goats! It is certainly an inspirational place to be. You can't help but be drawn into adventure with surroundings like this. As we walked in I could see eager faces peering round corners and a hushed whispering of, 'Its that Andy man - the runner man'! The school itself is a colourful place, full of artwork and photos and again, as at Kirkby Malham school, the enthusiasm of the teachers is everywhere. The classroom rapidly filled up with the small and not so small and the excitement was infectious. 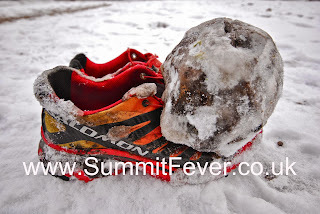 As I filmed Andy's presentation, I found myself giggling along with the children as Andy dressed Ryan up as a Spine race runner - layers and more layers of clothes topped off with a dinosaur hat, a headtorch and he even had his own ball of ice on his shoe ( for those not familiar check out image to the right of the shoe of last years winner!!). All the children we have met so far have thrown themselves into Andy's challenge, with no doubts or fears just an extraordinary degree of confidence, which, I don't think I'll be alone in saying, I wish I could do too! It was heart-warming (is that too corny?! I can't think of any other way to describe it), to see them all getting stuck in - the older ones holding the hands of the younger ones, the cheers from the teachers, the faster one waiting for the slower. With no need of coaxing, the school was already acting like a team and thinking like a team. There is a lot to learn from these young'uns. It can be easy as an adult to maybe not give the children the attention they deserve or to take them as seriously as we should, I am certainly guilty, but I was certainly taught a lesson by the end of our day. 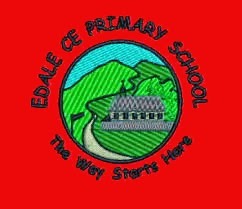 And so it is to Edale we go tomorrow! If you can help us reach our target to make this film please have a look at all the lovely rewards we can offer in return! Calling all Bloggers! : Get your blog on film credits! 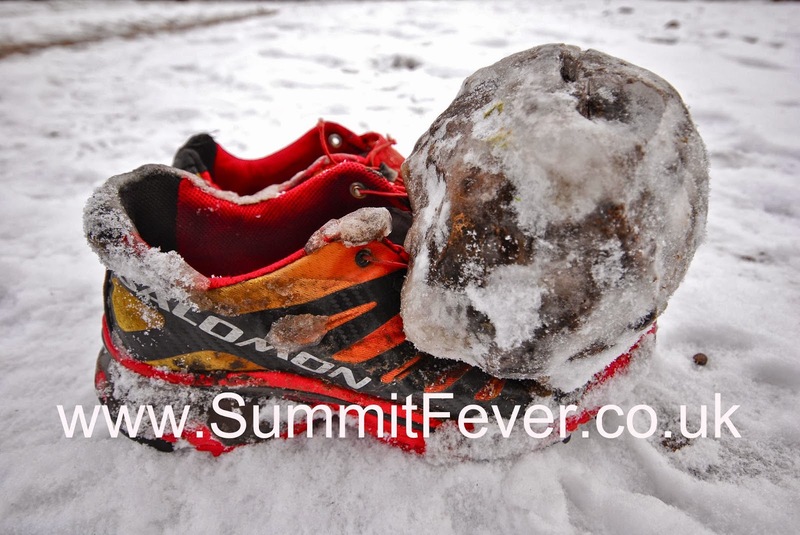 Britain's most brutal footrace takes place this january: The Spine Race is 268 winter miles south to north on The Pennine Way. 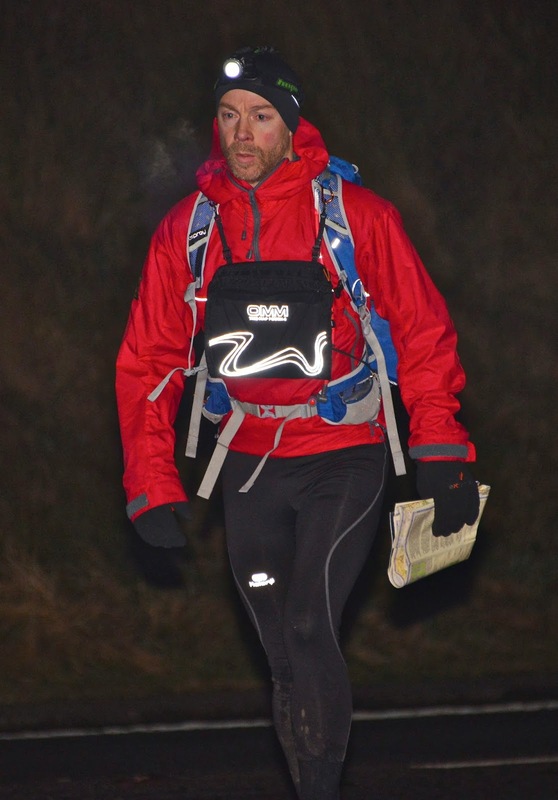 In 2013 nine competitors finished within the 7 day limit and experienced ultrarunner Andy Mouncey wasn't one of them. In 2014 he aims to put that right. Limited daylight, remote wilderness and winter weather will combine to make the hard miles even harder, and on top of that Andy will also need to control his own demons and beat the toughest competitor of all - himself.